New resolution re Ride Reports. They’ll be short and sweet and if possible, done on the day. Here goes: What a beautiful day. Freezing mist hanging over Ladywell Fields as I headed out about 7.30am. Pedalled fast as I could to Norwood Junction for the train and hopefully a hot coffee. Norwood Junction doesn’t seem to function before 8am on a Sunday however. But when others arrived a bit later, they went off on a coffee hunt. And returned. Laden with coffee. Nick had even bought extra. What a guy! Finally on our way to Coulsdon. It proved to be Town, rather than South, so it was a close call on my finding Farthing Down. But I did, with a little bit of cyclo cross thrown in, gathering our bikes up on our shoulders and heading down steps. All planned. Obviously. The sun was beginning to break through the mist as we headed on to the Down. Rumbled across the cattle grid. Into a herd of brown cows who mooed ominously as we passed, but just watched. Soon after comes the first of many descents. This ride has lots of up, but it’s worth it for the multiple descent count. They are all different and all terrific. Into Bletchingly, then a fairly flat bit to Outwood, stopped at it’s lovely little windmill for a bit. Then cross country from there to the infamous evil Tilburstow Hill. Thankfully free of HGV’s on a Sunday. A grinding slog to the turn off down The Enterdent, a favourite little descent of mine. Today, the entrance to this usually empty lane was full of about a dozen other cyclists, cheering their club mates up on a hill climb event. There were four to go, including one very fast and fit eighteen year old, who shot up so quickly he nearly zoomed off down Tilburstow. The hill climb over, we began our descent, thankfully free of kamikaze squirrels on this occasion. Then up through Church Town, a picturesque hamlet, church and almshouses. Over an A road and a motorway and up Gangers Hill, which is a bit of a beast. People were craving refreshments at this point, so we stopped off at Botley Hill Farm. 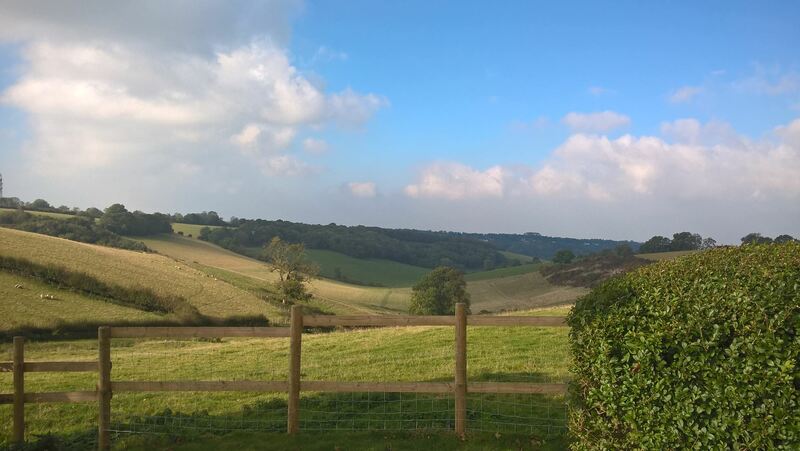 The view from its garden was stunning, with an added bonus of two red kites soaring over the fields as we arrived. Here, we had a call from another rider, who was expecting us to pass through Shoreham. That was when I realised I had tentatively suggested I might head that way a while back, to do a longer ride returning via Eynsford. I didn’t realise anyone had actually listened to my vague Facebook group ramblings! Trevor (for it was he) decided to ride on and meet us somewhere on our current route. We left the Farm, heading back along Clarks Lane and then down, down, down yet another great descent to the Pilgrims Way. Which, as always, was heaven to ride, despite a pretty fierce headwind, this time in Autumn sunshine, the seasons colours glowing all around us. There we met with Trevor. Up Sundridge Hill, then to Knockholt, where I couldn’t resist the rollercoaster of Shelleys Lane. On to Cudham Rd, with that great steep swoop that launches you into its descent. Up to Downe, where we resisted the temptation to share a pint with Farage. Ian left us here, to hammer out a few more miles at his more usual pace, I expect, i.e much faster than us! Having done a terrific job, minding us at the back. Lovely to see him. Then it was one of our usual routes in or out of Kent, Jackass Lane, just catching a glimpse of the Shard and Crystal Palace in the distance, before finally reaching the edges of suburbia and the last nine or ten miles back to Ladywell. Thanks to all who came out on this truly beautiful day. I hope you enjoyed it as much as I did.